She has lived in 6 states and has an Icelandic name and is part of our family! Vigdis is the puppy that joined us almost 16 years ago and has moved from the DC area to the great Southwest, then to the Low Country at Charleston AFB, then to the beautiful Northwest, made a short stop in Ohio and has settled into Michigan with us in our retirement place! She has also visited many locations with our adult children as we PCS'd to avoid lengthy stays in the kennel while we waited for housing. Her travels have been epic (do I dare say she hates to fly!?? )and frequent. Her roles in the family have been just as varied. She has been a guard dog in Albuquerque when our house was broken into; a friend to introduce our new grandchildren to and who allowed them to say hello in a child's way with barely a peep. A friend on the long walks we have taken in many places. She chased the geese away at McChord AFB as we laughed aloud and then held our breath as she took on the bigger dog who she deemed a threat. But always an even spirited friend and the perfect hostess when other pets visited. But this weekend Vigdis showed us that she was old despite a clean bill of health from the vet (although the fact she is deaf is pretty clear). She started having seizures or some other trauma that caused her to act very sick and caused us to start thinking of what might happen. After dealing with her most of the night we woke up wondering if we would find her awake in her normal sleep spot under our bed. She has always slept there as if she knew that was her guard duty location (I need to mention that is where she launched from and chased the intruder in New Mexico who had broken in and she chased him away before the household males could engage the bad guys!). Knowing she was there while I was away on a long TDY mission made it easier for me to rest comfortably. She is truly a military brat in the best sense of the phrase and has served us and the country well! We have picked out a beautiful spot in our woods for her that we had previously nicknamed Eden. Maybe she will surprise us and stay healthy for a bit longer but we are preparing for the worst and it is not easy. We hope your family can enjoy a pet as they have added so much to our lives and have been great partners with us during that crazy and hectic lifestyle of a military family. There are many opportunities to adopt and enjoy a pet! Just remember they do become part of the family and need your love and care. Give a 5 year old, or a 50 year old a stick, a place in front of an outdoor fireplace, unlimited marshmallows, chocolate and graham crackers. Ahhhhhhh life, it is good! We live in the country. We clear land, burn wood, cut thin branches and eat s'mores! My daughter lives in suburbia. 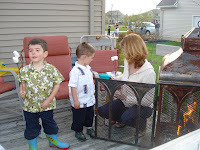 They buy wood, fire up the deck fire pit, and use coat hangers for the 'roasting', and eat s'mores. Simple pleasures. Life long memories. Instant road back to childhood. Instant road to 'maturity' - holding something so close to the fire. (With permission!) One roasted marshmallow can cover a square foot of skin in less than it takes to roast another, but that is why we lick fingers, right? Chocolate was invented for this delight I believe. 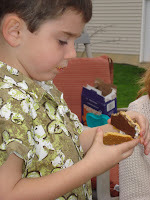 It melts with the 'mallow' and glues to the graham cracker, then compliments each part to perfection. Yes, I love simple pleasures, childhood memories, and children! I know, Spring has not dug in completely. But summer is coming! Out of door time, sunshine, rain showers, newly moved grass, puddles and fire pit fires! I can only imagine that marshmallow companies hibernate for the winter... ready to start popping those white squares into bags come April. Graham cracker factories are up for the new season. Think about it... where was the last place that you had a s'more? Where was the best place? Such a difficult recipe! Ha ha. Do you have a favorite campground? Tell us. Send us a a picture, I bet there are smiles with those s'mores! Seasonal changes help me value my source of year long strength! My husband is a leader, listener and life partner: full of love and laughter. I have listed Dave Letterman style, top ten attributes of Dale. I know it is a personal blog entry... but I know it is a good thing to share personal pride and bits of his personality. It is fun to write him up this way! **Open Mind: listen, value, accept or reject ideas. 8. Change is good. Experience is Better. 6. Look to the future, not the immediate, but a few steps ahead of that, so you can be organized and ready to move upward and onward. Don’t step on anyone on the way up either. 3. Integrity: your word is your honor, and respect others who expect those words to be honored. Even when they don’t return the value. 1. Family is beyond a doubt a gift from God and should therefore be regarded as important and trustworthy. It is really interesting to list your spouses attributes. Give it a try. I recognize the military training that is so very instilled in him. What would you put down for your spouse? What a week! I have never been on such an amazingly, terrifying roller-coaster in my life. But this isn't one you find at Cedar Point or Disney World. No this is emotional. Saturday was my husband's going-away party for his upcoming deployment. Friends and families came to wish him farewell. Of course I looked at it more as "See ya later" then "Good-bye". I had a nice time. Our neighbors were here, my family came in from Michigan, Hubby's family was here (most happen to live in the area) and friends from work and small-group all dropped by. We had a Taco Bar with all of the fixings. My mom and I cooked up all the meat & rice the day before so the day of it was a matter of reheating it. We chopped, chopped, chopped the day of: tomatoes, onion, lettuce, peppers and more. We put cheese, sour cream and salsa in bowls. We had soft and hard shells available. It was a hit. When folks arrived I had many comments about what a nice & different idea tacos were. Hubby's family also brought in food. I never turn down help so when folks asked if they could bring in some food I was quick to say 'sure'. It added to the variety and Hubby's aunt's fruit salad was a hit. Our siblings were in charge of sodas and we had plenty, plus a cooler of beer. I had all the sodas in coolers of ice on the deck. Made it comfortable to linger out there as guests found new friends & old to mingle with. In the kitchen we set out wine (red & white) & put some of the harder stuff behind the wine. We had all of the glassware sitting out by the wine. The weather was perfect until about 7:00pm. So we spent the first three hours of the party on the back deck. When the rain started we headed in. No stress, we just went with the flow. We put up some brown paper that is used to cover packages on a door with a basket of markers & everyone wrote a short message to Hubby; dubbed "Our Wall of Well Wishes". I will send it to him or pack it in his gear depending on how much room he has. It is actually still hanging up and I love walking by it and looking at what folks wrote. The younger kids even drew a few pictures for him on the paper. By 9pm most folks had headed home and the immediate family was left to do some quick cleanup. I was putting hot-peppers back in a tupperware container & must have gotten the juices on my hand. When I rubbed my eyes (a little tired, a little weepy) 20 minutes later they burned! That was enough to put me over the edge. Sitting on the stairs I just broke. The party was wonderful, but the reason for the party had my head spinning. It's that roller-coaster that I so desperately want to get off of. My mom walked around the corner and found me. Moms give great hugs. We sat on the stairs: me sobbing, and she just held me. I felt a little bit like a 13 year-old again, with a broken heart. She has always been there for me. She knows when to show up & when to just hang back. Thank God for Moms! BTW, Hubby & I got away, just the two of us, on Monday & Tuesday after the party. That trip was definitely part of my 'high' on this deployment roller coaster! I'll write more about that later. PS: We had most of the alcohol sitting in our kitchen where people were hanging out so that it was very clear who was grabbing a drink. If you are hosting a party you are responsible for any under-age drinking! Don't let a party put a stain on your (or your spouses) military career. If you are considering a party keep tabs on the alcohol. Put someone in charge if you know you will be busy mingling with guests. How to get the most miles to the gallon of gold (gas)! We are all looking at the gas pumps today and thinking about the impact on the monthly budget and that vacation or trip home for the family reunion this summer. How about that PCS move this summer? I started thinking of ways I have used to improve the mileage in my vehicles and a couple of things quickly come to mind. Its not an extensive list but just some common things you may have forgotten or just needed the reminder to help yourself a bit. First, check those tires for proper inflation. After a long winter pull out that tire pressure gauge and see where they are at and put the gauge in a convenient place to remind yourself to check often. Fill them to the manufacturers recommended maximum for the best lift and mileage. When was the last time you had the filters changed and general maintenance done on the car? A dirty air filter or worn emission systems or dirty fuel injectors can significantly decrease your mileage. How much extra weight do you have in the car? I have a vehicle with a trailer hitch and I removed it and put it in the garage and only use it when required. That hitch weighs about 10 pounds and think how much gas it would add to a trip when I didn't need it! Look in the trunk for those items you "forgot" to remove and get that weight out of there. Did you know that using the air conditioner on the interstate highways is more fuel efficient than having the windows open? With the windows open you create extensive wind drag on the vehicle and it uses more gas! We traveled extensively at night and early morning to avoid the heat of the day which improves the kids time in the hotel pool and limits the number of hours with the air conditioning running. Also, around town trips at slower speeds are better with the air off and windows down as there is less drag. How about that long line at the drive through window? You can sit in the line idling and reducing your miles per gallon or pull into a spot and turn off the motor. In a hurry? Take the food to go but don't sit in line with your car running. Planning to go shopping at the same time? Make one trip, do a list and avoid multiple trips. Does the car need to be washed and waxed? Spend a little elbow grease and get better mileage! That wash and wax job can save around 5% of your gas on a long trip at higher highway speeds (due to less drag--the pilot language always comes back). So maybe the last thing you should do before pulling out on that PCS is driving through the local car wash.
Have a cruise control? Use it on flat terrain and it will improve your mileage but on hills or mountains it will drop you down a gear to accelerate quicker than you would and decrease your mileage. Try to stay in the highest gear possible and no quick downshifts to high engine rpm on that tach! When I am on a long trip I like to track my "instant mileage" on the vehicle's data. Many cars have them and it helps me remember how much the gas cost at the last fillup and makes me less aggressive and drive smoother to save that precious gold in the gas tank! Recently, our kids and grandkids decided that we all needed a weekend getaway! We found a state park with a wonderful old inn that was a short drive (less than 200 miles) for all the family to meet and the facilities were great for the entire crew. 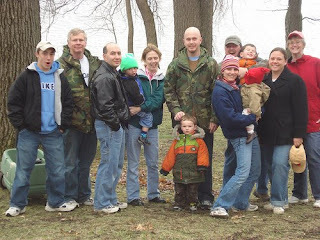 Pokagon State Park is at the intersection of I-69 and I-80/90 and is only about 3 hours from Wright Patterson AFB, OH, 3.5 hours from Great Lakes Naval Training Center,IL and 2.5 hours from Selfridge Air National Guard Base, MI. The park had hiking trails, a horse barn for saddle enthusiasts, an indoor pool to entertain the younger set, a game room with air hockey, ping pong, and video games, various restaurants and fun spots just to hang out. We actually found an outdoor porch on the second floor that with a quilt or two provided a lot of evening entertainment as well as we sat and overlooked Lake James. The weather wasn't very cooperative with a mix of rain, snow, wind, cloudy days and cool temps but hey some of us lived in Iceland for almost three years. We found a way to make outdoor adventures work and three of the guys actually went for a very short swim in a lake that was about 35 degrees (of course they did have a hot tub nearby but the 100 yard run back to the inn was a bit chilly!). Two went horseback riding, some hiked and visited a nature center and we all found ways to save a few dimes by packing breakfast and lunches for the whole crew for 2 days! We found another place to enjoy ourselves and probably will go back, too! This was a great time to stretch out and relax after a rather long Midwestern winter and we also honored one of our own who will soon deploy as well. Thank you is a simple thing to say but we wanted to do more. We all understand the challenges; sometimes we just have to make an effort to let them know we understand! Have a favorite weekend getaway spot? Tell us about it and why you like it! Feeling weepy & fighting a cold I headed off to MOPS with my two boys regardless. We have 'two chapters' of MOPS at our church. I help with child-care during Alpha week and then I attend the actual meetings on Omega week. So it's an every other week thing. As I was driving home I realized that this was my last time doing child-care this year. I have been with these kids since the Fall and I am really going to miss them. It wasn't always sunshine & flowers in there. (I'm really not a very patient person... and 5 year-olders are pretty good at trying-patience.) But even on a gloomy day, like yesterday, they can cheer me up. I will miss their last meeting because I will be away at my husband's official going-away ceremony. Summer is coming, Hubby is leaving... we heavy plenty of 'New Beginnings' starting in our household! That reminds me, this Sunday MilitaryAvenue.com is publishing our monthly newsletter. This month's theme is "New Beginnings." If you haven't subscribed yet you can do so at: http://militaryavenue.com/NewsletterSignup.aspx. It's a fun monthly newsletter full of *your* favorite articles from the site as well as some great new content from partners & our team. Wednesday was small group at my house. I am enjoying the company of our weekly small-group from church. We are a range of ages. Hubby and I happen to be the youngest at 34. The oldest couple's child just left for college this fall & they are empty nesters. One member of our group is single and another member's husband has dart-league the same night we meet. Soon Hubby will be gone and that will just add to the dynamic, me being the temporary single-mom. So we are a group of 14 of all different backgrounds and I love it. The month of April "Small Group" has been at our house. Once a week at around 4pm I go into a frantic frizzy of cleaning. You would think that I would be able to keep an 'unused' room (our living & dining room) clean from week to week ... but I picture a 'Toy Story' type of scene every night around midnight. The toys, dust, dirt, Hubby's army gear all crawl into the Living Room and have a giant party. I don't know if they can't just find their way back to where they came from come dawn but once a week I have to round everything up, dust & vacuum my 'unused Living Room'. On top of the cleaning the 'host' usually provides some light food. A few folks come right from work so they haven't eaten dinner (which would actually include me since I go right from working to cleaning) so the idea is to have something a little substantial that isn't too much work. (I'm all about that 'not too much work' part.) This week I made 'Artichoke Dip' with crackers ... made is kind of 'relative' since all I had to do was chop chop chop (in my food processor) & then dump in a casserole dish. Hubby was put in charge of the meatballs which he cooked in the slow-cooker. He didn't even have to chop - just dump. It was a wonderful night full of deep (& not so deep) discussion. Hubby always impresses me with his breadth of knowledge. I know I'll miss that when he is gone... sigh... there will be so much I miss. By the way... I haven't given up on the couches yet ... http://militaryavenue.blogspot.com/2007/03/some-old-something-new.html but Small Group doesn't seem to mind a bit having to sit on our hand-me down couches, it is better then the floor, right?! We moved so many times and to so many different climates from tropical; to near Arctic; to desert SW; coastal Carolina and Pacific NW. We appreciated learning new plants and trees and really enjoyed relaxing in our new garden once we got into the house. I think one of our best stress relievers was walking outside during the moving in process and taking a look around and dreaming/planning what we could do with our yard and the landscaping. Fast forward to our retirement home and walking around deciding what trees and plants can go where! So much fun and maybe we could see them in 5 years! Then we pulled out a tree catalog and said maybe we should plant some of these here and there! What fun! One of the trees we picked was the beautiful Redbud which would grow in the climate of our new Midwestern home. We decided to purchase them in the spring with several others and then walked our yard during our October move in to decide where to put them! 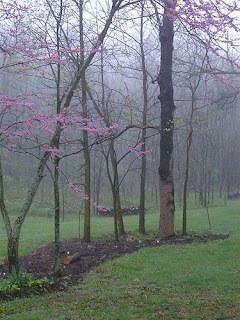 Imagine our surprise the next spring when we realized that our yard and woods were full of Redbuds and we would not need to purchase them! What a blaze of purple they provide in late April and how we look forward to seeing them! And as a side note who ever named them "Redbuds" since they are definitely not red?? As a military family we experience so many different areas of the world and we get to learn something every move about our new environment! Why not plant a new tree in your yard as something to leave for the next family and to provide a bit of support to our environment! We all need the trees and certainly they support the local bird habitat and keep our air cleaner! If you have young family members; let them help you during this Month of the Military Child and they will have a memory of digging in the dirt and making their earth a better place! My son opened his first checking account this last weekend. He is 14 and can barely hold onto a nickle before it is spent. Financial Independence. I was 16 when I got my first credit-card. I was preparing to travel to England with our high-school drama team. We were stationed at Keflavik NAS, Iceland and I was no actress. But it was an opportunity to get off of "The Rock" as we so lovingly called our little part of the island. Mom & Dad decided I needed a way to pay for things beyond carrying around a lot of cash. The card was attached to my parents' name too but, man, I felt like big stuff. That credit card and I had our good times and our bad times together. I realize looking back that my parents must have really loved me because there were a few purchases made on it that they probably could have said... "Ahem, Leanne, what is this on our statement?!" But they didn't. Eventually (like the day after I graduated from college) the bills were turned over in my name entirely. I knew better then to run out and make big purchases because having a credit card wasn't new to me. That credit card had to be paid off every month (carrying a balance was a foreign concept to me) and I really think it helped me get on my feet. I had enough 'firsts' going on: job, car, apartment. I'm glad "credit card" wasn't one of those. I have my fears, (don't parents always?)... overdraft, losing his ATM card etc etc but I'm sure my parents had their fears about that credit card of mine. I'm thinking that having something new like this at a young-age will make it 'old-hat' by the time he is on his own and not under mom's and dad's wing so much. We will be there when he has to balance his checking account. He'll see the tiny bit of interest he is going to make and our hope is realize that it is better to keep money in his account and to save then to buy on an impulse. Time will tell! At this point I have the power; too much over-draft fees and we will close the account. I'm certain that won't be the case. It is still pretty cold here in the Midwest, the danger of frost certainly has not passed. In fact, I wouldn't be totally surprised if we got more snow (aghast) between now and the end of the month. However, my boys and I have started our summer garden. Before I dive into the topic of our garden I have to share a 'funny' story about miscommunication. My husband was going birthday shopping with the boys last Saturday for me. I asked him while he was out to please pick out some seeds for our annual vegetable-garden. He won't be around this year for our vegetable & herb garden so I thought this would be a great way for him to have a hand in it, picking out which plants we would grow. A is for April... every Military Child gets an A too! April is just jammed packed with action. It is after all the month of the Military Child: right there my mind is racing through pictures of friends, their babies, my babies... and my babies' babies. Whoa... better stop. April comes in like a lion... and out like a lamb. April Fools. April showers bring May flowers. They all relate to those military children: Hear the roar of their excitement, patriotism, experience and networking friends. See the shy sheepish look as they once again enter a new school building. But don't forget the warmth of their smiles! Catch that glimpse of a sparkle in their eye when they realize the new PCS isn't a joke... no fooling. However moving to Florida means swimming in the Gulf of New Mexico on Christmas Day which isn't a bad idea either. Now come the flowers: and the truth that blooming where you are planted is the best advice to grow and gain confidence. Want to help your military child? Explore avenues of interest that challenge, support and create interest. A fertile mind is an active one. Talk with your children about the highlights of the move before it arrives. Spring has so many metaphors that apply to life. Talk to your children about the loss of a friend who is moving away. Help them get out of the house, into school programs, sport programs, church programs... the list is like a seed catalog! Help your children, and you are helping yourself and all of us! As your military children are fantastic and our future. Thank you!